Pentair’s BMF Compact S product range is the ideal solution for craft and small breweries with an annual output of up to 100,000 hectoliters. Pentair’s BMF Compact S product range meets the requirements of breweries with a 3-60 hl/h capacity. The compact beer membrane filtration units give brewers a fully automated process that can be interrupted at any time. This true start/stop filtration is especially beneficial to craft brewers who produce a wide variety of beers. Small batches of beer can be run with constantly excellent beer quality and very low beer loss. BMF can treat beer up to 5 million yeast cells per milliliter, and filter a wide range of beer types, including full malt or beers with adjuncts, dark beers, low alcohol, or high bitterness. Pentair’s BMF provides flexible installation and integration. The preassembled filter units are stand-alone solutions on a stainless steel frame. To install the BMF in an existing brewery all that is needed are incoming and outgoing beer connections, water, power, compressed air, and carbon dioxide. Complex DE handling and disposal is eliminated with BMF. And since no DE kitchen/storage is required, valuable space can be saved. The BMF Compact S product range is ideally suited for craft and small breweries with capacities of up to 60 hl/h that produce a bright filtered beer. The compact modular design of the skids fits even challenging space requirements. Connections for beer inlet, beer outlet, water, de-aerated water (if available), power, air and CO2 are included in the scope of supply. Pentair’s BMF is a well-established solution for today’s brewer. More than 100 BMF systems have already been commissioned, currently filtering more than 100 million hl of beer annually. The use of membranes provides major advantages compared to diatomaceous earth (DE) filtration, including better yeast cell and beer spoiling bacteria retention, shelf life and taste stability. This is due to the membrane’s narrow pore size distribution and the fact that no iron gets into the beer via the filter-aid as it is the case with DE. Iron is a well-known catalyst for the oxidative biochemical reactions in beer leading to off-flavors associated with aged beer. 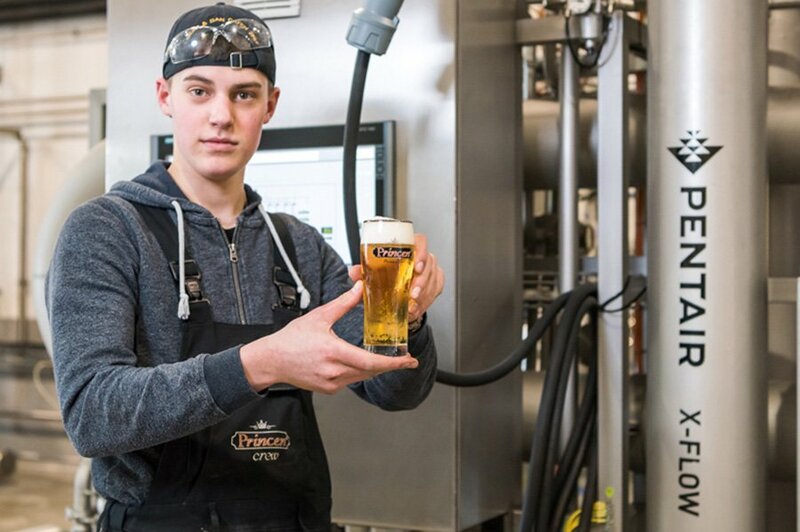 In addition to providing an excellent and consistent beer quality, BMF reduces labor needs to a minimum through a robust and fully automated filtration process. And as no DE handling and disposal is required, the solid waste stream of your brewery is reduced significantly. Proven Pentair beer membration technology known for it's positive effect on the quality of the filtered beer.